Colombia is a country in northwestern South America. The country, composed of three states (La Libertad, Cundinamarca and Meta) is bordered clockwise by the extensive Caribbean Sea, Venezuela, Brazil, Peru, Ecuador, Western Canal Zone in the Pacific Ocean and Panama. The United States control the important Panama Canal. The capital Bogota is located in the central state of Cundinamarca. Although Colombia is as large as France, Spain and Portugal combined, it is a minor country in HOI4. The weather and terrain are difficult; most of the country is mountainous and the climate is Very Hot in a number of provinces, making attrition very high. The border region with Panama, the Darien Gap, is one of the least accessible places on Earth; the Pan-American Highway stops just before and continues in Panama again. As a minor country, Colombia starts with the generic National Focus Tree, 2 Research slots and 8 factories; 7 civilian and 1 military. Three free slots are available at 1936 start. Two airfields have a combined capacity of 1200 planes and two developed naval bases at game start are at the Caribbean coast. The developed equipment is outdated and comprises for land units Infantry Equipment I and Artillery I, Destroyer I (Navy) and (Airforce) Fighter I, with additionally the Carrier version researched. The country has a Democratic leader, president Alfonso López Pumarejo of the Partido Liberal Colombiano (PLC) with 99% popularity, and does not belong to a faction. It is guaranteed by the United States, as are the other Latin American countries. 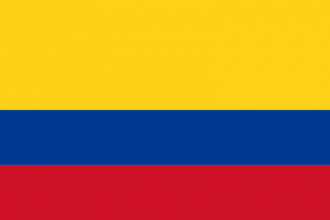 Colombia became independent from the Spanish Empire on August 7, 1819. Until 1903, Panama was part of Colombia. Shortly after, the contract and Hay–Bunau-Varilla Treaty for the construction of the Panama Canal was signed between French engineers and the United States, one of the most prestigious engineering projects in history, finishing in 1914. The Monroe Doctrine was established in 1823 by the United States, to prevent further interventions of the European powers in Latin America. In 1904, this was expanded in the Roosevelt Corollary that stated the United States had the right to militarily intervene in case European countries sought renewed colonialism in Latin America. Following this, Colombia, together with Mexico, tightened relations with the United Kingdom. In 1930, a period known as the Liberal Republic commenced with the election of president Enrique Olaya Herrera. Between September 1932 and May 1933, a short war with southern neighbor Peru took place after Peruvians declared the southernmost town along the Amazon River Leticia belonging to Peru. Leticia was founded by Peruvians in the 19th century. President Alfonso López Pumarejo was elected in 1934 and served until 1938 in his first term, to be replaced by Eduardo Santos. López Pumarejo focused on industrialization and economic reform of the country during his first term. Colombia declared its neutrality under Eduardo Santos when World War II broke out. Santos was opposed to the Axis powers. After López Pumarejo returned to power in 1942, he wanted to expand on the industrialization and economic reform started in his first term, but WWII impeded that. He was unpopular with the military commanders of Colombia and a coup was prepared to replace him. The coup d'etat failed in 1944 and López Pumarejo ruled until 1945, not serving his full four year presidency. Colombia, lacking a unique national focus tree, uses the generic national focus tree instead. Colombia is unique in South America as it borders both the Caribbean Sea in the north and the Pacific Ocean (Western Canal Zone) in the west. The country shares land borders with Venezuela in the northeast, Panama in the northwest, Ecuador in the southeast, Peru in the south and Brazil in the east and southeast. The country is subdivided into three states; La Libertad in the north, bordering the Zulia state of Venezuela in the east and Panama in the northwest and the two seas; Cundinamarca in the center also bordering Venezuela (Zulia and a small strip of Miranda state) and Ecuador in the southeast and the Pacific Ocean and Meta, bordering Venezuela (states Miranda and Bolivar) in the northeast, Brazil (Amazonas state) in the east and southeast and Ecuador and Peru (Loreto state) in the south. The majority of the country except the south of Meta is part of the Northern South America airspace. The sea regions bordering Colombia pertain to the Caribbean Sea (north) and Western Canal Zone (west) airspaces. Panama belongs to the Central America airspace and the southern part of Meta and bordering Brazil and southern Venezuela are in the Amazonas airspace. The Andes runs straight through Cundinamarca, where also the capital Bogota is located, making Cundinamarca a very mountainous state with one jungle province. The La Guajira Desert in the northern tip of Colombia is in HOI4 represented as Forest. Major rivers are the Cauca (La Libertad) and Magdalena Rivers (La Libertad and Cundinamarca) flowing from south to north into the Caribbean Sea. Meta state has three major rivers; the Meta River flowing into the Orinoco to the northeast and two rivers part of the Amazon Basin to the east into Brazil. Three provinces in Meta and two in Cundinamarca are Very Hot, giving Heat Attrition +10.0%. At 1936 start, as all Latin American countries, Colombia is guaranteed by United States. Colombia does not have any alliances to begin with. Colombia is Democratic and has the first election in February 1938. National unity is 70%. At 1936 start, Colombia has 1 Military Factory (Cundinamarca), 7 Civilian factories (2 La Libertad, 5 Cundinamarca), 0 Naval dockyards and 3 free slots (2 La Libertad, 1 Meta). In total the country has 11 unlocked slots. Colombia was in 1936 already an oil-rich country and produces 20 in La Libertad state, but lacks any of the other resources that you need to acquire via Trade. At 1936 start, Colombia has a deficit of -2 of Steel, needed for Infantry Equipment Production. At 1936 start, Colombia produces only Basic infantry equipment (model 1918) at 6.41/week. It can additionally produce Support Equipment and Towed Artillery I. At 1936 start, Colombia heads off with 8.00 M population and, due to the Volunteer Only Conscription Law, 120.15 K Total Manpower. Used Manpower is 25.80 K with 500 for the Navy and 600 for the Airforce. This leaves a Free Manpower of 93.25 K.
At 1936 start, Colombia has two Naval bases in La Libertad at the Caribbean Sea; 5/10 developed, Capacity 50 (~Cartagena) and 1/10 developed, Capacity 10 (~Barranquilla). The Armada Nacional, the National Navy, is stationed with two Destroyer I in Cartagena. The country has 15 Convoys. At 1936 start, Colombia has two airfields, 1 in La Libertad (capacity: 800 planes) and 1 in Cundinamarca (capacity: 400). 30 Fighters are stationed at the Cundinamarca airfield. At 1936 start, Colombia can additionally produce IW Carrier Fighter planes and Transport Plane I.
Colombia starts in a favorable geographical position with access to both the Caribbean Sea and the Pacific Ocean. Although no naval bases are built at the western seaway in the Western Canal Zone (Pacific), it is possible to build them there to have two naval fronts. The country is surrounded by Panama (Democratic) with the Panama Canal occupied by United States with just 3, but very strong infantry divisions with artillery. The eastern neighbors are Venezuela that is Fascist and Brazil which is Non-Aligned. In the south are Ecuador (Democratic) and Peru (Democratic with the Fascist party ruling in 1936 with 51%). The Netherlands is just off the coast to the northeast with Curaçao. Farther to the north are Jamaica, ruled by United Kingdom and farther north the Caribbean countries Cuba (Democratic), Haiti (idem) and Dominican Republic (Fascist). All Latin American neighbors are guaranteed by United States, just like Colombia itself. The production capacity of the country is low at the start of the game, with 7 Civilian Factories and only 1 Military Factory. All resources need to be traded, except for oil which is plenty with 20. A good idea is to boost the industrial construction with the National Focus Tree on Industrial Effort -> Construction Effort, reaching the Extra Research Slot as fast as possible. That combined with the Research on Industry to enhance the capacity of the country. Because of the low capacity, it makes most sense to start the game playing Colombia in 1936, not 1939. Democratic Colombia is surrounded by two Democratic countries, Panama and Ecuador, 2 Fascist countries Venezuela and Peru and Non-Aligned Brazil. As popularity of the ruling Democratic party is 99%, with only the Communist party at 1%, it takes quite a while to change Ideology. The historically most correct way would be to stay Democratic and Neutral. For gameplay and to be able to declare war on your neighbors without too much World Tension, it makes sense to shift to Fascism or Communism; due to your neighbors, the former is the far better option, also to join the Axis Faction. The only Communist country in the whole Americas is landlocked and poor Paraguay. To move to Fascism, several options are offered and if you want to prevent your country to end up in Civil War and be divided in two (La Libertad turns away, making you lose your Caribbean Naval Bases, all of your oil, and the time and troops to gain La Libertad back), the best option is to go for population reforms around the elections of 1938. When Colombia turns Fascist, it takes the name Nueva Gran Colombia, referring to the historical Gran Colombia times when present-day Venezuela and Ecuador (and Panama) were part of the country. In case you choose to go for a Communist Colombia, the name changes to Colombian Socialist Republic. Note that although the United States is guaranteeing your neighboring countries (and yourself), they only take action when a European power invades Latin America, allowing you to expand freely in most of the Americas (the British, Dutch and French colonies are not guaranteed) without them intervening. Political Advisors can be used to turn your country Fascist or Communist and to boost your industry there are various options. You may want your military command to focus on land battles first with naval battles and airforce for later, depending on the direction you take. Colombia starts rich in oil in La Libertad state, but lacks any of the other resources, so you need your 15 convoys and most of your Civilian factories for Trade. Ecuador has 2 , Peru 18 and 2 Tungsten, and Venezuela is extremely oil-rich with 184 . The Guyanas host vast resources of Aluminum; 112 in British Guyana, 12 in Suriname and 104 in French Guiana. Farther south, Bolivia is rich in (102) and has 2 Steel and Chile hosts 24 . Chromium can be acquired in Central America, between Panama and Mexico, but especially Cuba (160). Brazil is generally poor in resources, but dominates the South American Rubber market with 30. Logical focuses for war are your weak southern neighbors; especially one mainland state Ecuador (also has the Galapagos islands) and Peru. Venezuela is a good target as a next step later on, or keeping them as a buffer country. Another set of possible targets that have little unlocked slots but major aluminum resources are the Guyanas, from west to east colonies of United Kingdom (British Guyana), Netherlands (Suriname) and France (French Guiana). While they are fighting with the Axis in Europe and Africa, their colonies are sparsely occupied by minor troops and can be easily taken with Naval Invasions, just as Jamaica, Trinidad and Belize (British Mexico). Your northwestern neighbor Panama is split into two parts with the US occupied but very important Panama Canal in between, a good strategy for the longer term. Because of this barrier, you need Naval Invasions for the northern part of Panama. There are only three US divisions stationed at the crucial Panama Canal, but they are extremely strong in Attack (Soft and Hard) and Defense and trying to conquer the Canal brings you into war with the far superior United States. To get to conquer the Panama Canal you also need a lot of naval and air superiority. Because of the terrain (mountainous) and weather (jungle, hot, storm), the attrition is very high and armor (tanks) is not very effective. Better to focus on a lot of Infantry, armed with Artillery, to succeed in the Andes and surrounding jungles. Air superiority is not a major problem; your neighbours have small Airforces. After you turned Fascist (or Communist), the access for your Navy through the Panama Canal is blocked, but you can build a Naval Base at the Pacific coast in Cundinamarca (or western La Libertad) to maintain access to both sea regions. For the longer term strategy when you want to expand into the Caribbean, up to the southern US, Brazil, Chile or northern Central America, and need longer range Air superiority, you may want to research Carriers as the Carrier Version Fighter plane is already researched at game start. Or alternatively research paratroopers and/or marines for invading the Caribbean islands and/or Central America easier. Note that to gain Victory Points in Brazil, you need to cross the enormous Amazon rainforest with high attrition and many rivers, so you might want to have established multiple fronts in the south (Bolivia, Argentina) and north (Guyanas) as well as carriers for air superiority before you start that major task. Form Gran Colombia and have 10 Carriers and 10 Battleships. This page was last edited on 3 June 2018, at 21:16.